Jio Happy New Year Offer || 100% cashback will be available at Recharge of Rs 399 - mobilereview.online - The Ultimate resource for mobile phones reviews, specification, information. Reliance Jio has announced 'Jio Happy New Year Offer' for its customers on Friday. Under this offer, 100% cashback will be available on recharge of Rs 399. The new offer will be available to the Jio Subscriber until January 31, 2019, which has been brought in partnership with the fashion portal Ajio. This means that the amount of cashback will come as a coupon of Rs 399. This coupon can be used with Ajio's existing offer. Just a few days back, Reliance Jio decided to continue the Jio Celebration Pack, under which live subscriber gets additional 2 GB data for 5 days. 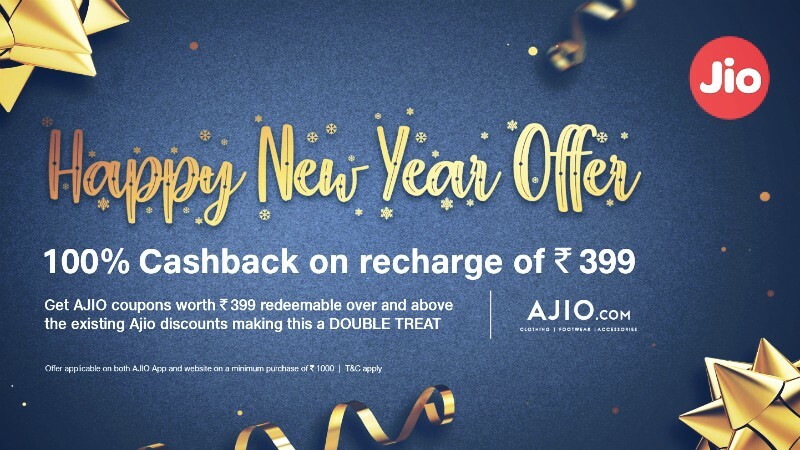 Under the Jio Happy New Year offer, the customer who buys Reliance Jio's 399 rupees Recharge pack will get a coupon of Rs 399. It can be used with existing Ajio offers. This coupon will be available in the MyCoupons section of the MyJio app. After this, the coupon will be used to make purchases on the Ajio app or website. But for this, we have to purchase at least a thousand rupees. Jio Happy New Year Offer has started from 28th December and it will run till 31st January, 2019. Ajio's coupon will be used before March 15. It is worth noting that Jio Happy New Year Recharge offer is available with a pack of only 399 rupees. Apart from this, this offer is available for existing and new Live Subscriber. With the benefit of Jio Happy New Year offer, you will get the Recharge pack of 399 rupees from the online and offline platform.